The U.S. Supreme Court's decision on Friday to hear a challenge to tough abortion restrictions in Texas raises questions about the legal fate of similar laws in more than a dozen other states. The court's ruling, due by June, could spell out the extent to which states can impose clinic regulations likely to restrict access to abortion as an outpatient procedure. If the court upholds the Texas law, similar laws would also fall. But if the court rules in favor of the state, then more states would be able to follow suit. "Broadly speaking, the rule the Supreme Court crafts will impact all different types of regulation," said Steven Aden, a lawyer with the Alliance Defending Freedom, a conservative legal group that supports abortion restrictions. A number of conservative-leaning states have passed laws in recent years governing abortion providers and clinics. The case before the Supreme Court focuses on two provisions of a 2013 Texas law. One requires clinics providing abortions to have costly hospital-grade facilities and the other requires abortion clinic physicians to have admitting privileges at a hospital within 30 miles (50 km). Ten of the 50 U.S. states have imposed admitting-privilege requirements similar to those in Texas, while six have enacted laws requiring hospital-grade facilities that mirror the Texas law, according to the Center for Reproductive Rights, which represents abortion providers in the case before the Supreme Court. In total, 22 states have specific licensing standards for abortion clinics, although not all are as strict as Texas', according to the Guttmacher Institute, a research group that supports the right to an abortion, but whose research is cited by both sides in the debate. Nancy Northup, president of the Center for Reproductive Rights, said that if the Texas law is upheld, "copy cat laws around the nation will proliferate, creating disparities in access to care." Courts have blocked six of the Texas-like admitting privileges laws, including measures in Wisconsin and Alabama. A Mississippi law mandating admitting privileges, which would have led to the only abortion clinic in the state closing down, was put on hold by a lower court in 2012. That case is pending at the high court and will likely be put on hold until the justices rule in the Texas case. Courts have been more favorable toward tightened rules for clinics providing abortions. Four of the six laws similar to Texas', including measures in Missouri and Virginia, have been allowed, at least in part, to go into effect. 12 other states including Florida, South Carolina and Arkansas, have this year considered enacting similar laws but the bills did not pass, according the Guttmacher Institute. Out-of-state organizations on both sides of the issue regularly intervene in advancing or trying to kill legislation in states around the country. 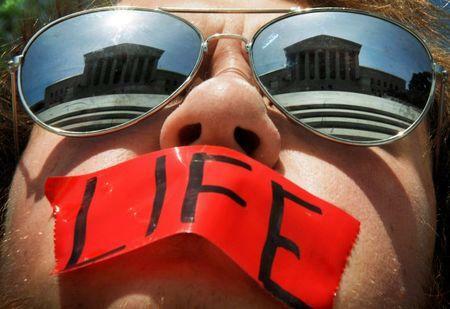 Americans United for Life, an anti-abortion group, has draft legislation that it encourages states to adopt. The group talks to state legislators, testifies in hearings and joins in defending laws in court. On the other side, groups like Planned Parenthood and the American Civil Liberties Union lobby against new abortion restrictions. Even when the Supreme Court in 1973 ruled that women had a constitutional right to have an abortion in the Roe v. Wade case, it made it clear that states could regulate clinics, said Denise Burke, American United for Life's vice president of legal affairs. If Texas wins in the high court, "it will give additional encouragement to states to follow Texas' lead," Burke said. She cited Nebraska and Ohio as states that would be among those most likely to enact new laws. The Supreme Court's ruling in the Texas case is unlikely to directly affect other aspects of the broader abortion wars. Courts, for example, have consistently struck down stringent laws that aim to ban abortions at earlier stages of pregnancy. In January 2014, the Supreme Court rejected an appeal from Arizona officials seeking to reinstate such a ban. But the justices will be asked again in coming months to take up the broader issue, with appeals coming that concern bans in Arkansas and North Dakota, both of which were struck down by lower courts.